Directors’ and officers’ liability insurance is a key resource for funding defense and settlement of claims without depleting the insureds’ assets. Private company D&O insurance, in particular, can provide exceptionally broad coverage to the company, its individual directors, officers, and sometimes even employees against shareholder litigation and derivative actions, criminal and regulatory investigations, and other business litigation claims based on negligence or breach of duty theories. When a venture capital or private equity firm makes a funding decision, the adequacy of the portfolio company’s D&O insurance typically is not a primary consideration. To be sure, firms are requiring indemnity agreements, and even requiring the PC’s to purchase D&O insurance, for the general partner that the firm places on the board. But such requirements are often worded loosely, with very little specificity. 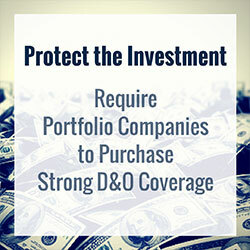 And D&O insurance –especially private company D&O insurance – is not a standard coverage. The policy forms vary widely from one insurer to the next, and even within a single insurer’s offerings. Thus, it is advisable to check the overall strength of the PC’s D&O insurance and make adjustments as necessary – if not at the point of initial investment, then at the PC’s next upcoming insurance renewal. The following are guidelines and key policy features to ensure that the PC’s insurance provides meaningful protection to the board members and the firm. Appropriate limits based on benchmarking through an experienced insurance broker. Make sure the PC is using a reputable insurance broker with full, direct access to all the insurers writing private company D&O. The broker should have demonstrated experience procuring D&O insurance for multiple companies of similar size and industry sector, as well as information concerning average litigation defense and settlement costs, and therefore be able to provide benchmarking on appropriate policy limits. For PC’s above a certain size threshold, require Side A DIC coverage. Side A “Difference In Conditions” or “DIC” coverage is a separate, additional tower of insurance available exclusively for the PC’s directors and officers, if the PC itself is unwilling or unable to indemnify them. In cases where the portfolio company is insolvent and the individuals are left exposed to in litigation, the Side A coverage can provide valuable additional protection, is subject to far fewer exclusions, and won’t get bogged down in bankruptcy proceedings if the company fails. Mechanisms for triggering “run-off” coverage. As firms know, even a successful exit won’t necessarily shield the PC or its investors from litigation down the road, based on conduct that allegedly occurred before the PC was acquired or went public. And of course, potential litigation threats abound following a failed PC investment. Thus, no matter how the investment is ending, firms should insist that the PC purchase “run-off” coverage to cover claims made after the effective date of the sale or IPO, based on conduct that occurred before the run-off date. Require a policy that allows the insured – not the insurer – to control the defense. Unlike D&O insurance policies issued to public companies, private company D&O policy forms may impose a “duty to defend,” rather than an obligation to advance defense costs. This subtle distinction is extraordinarily important in the insurance world, because a “duty to defend” policy gives the insurer the right to select the insureds’ defense counsel. Other policies may purport to let the insured select its defense counsel – but only from among a list pre-approved law firms, with no ability to select counsel not on that list. While there may be ways around these policy provisions, depending on the facts of the specific case, the better strategy is to avoid them altogether, so that the general partner serving on the PC’s board is never stuck with the insurer’s preferred counsel choice. Neutralize the “Insured versus Insured” exclusion. One major litigation risk for venture-backed startups is a so-called “founder dispute,” in which a disgruntled member of the founding team sues to challenge his dismissal from the company and/or the dilution of his equity interest in VC/PE financing rounds. In most cases, because the disgruntled founder was previously an officer and/or director of the PC, his lawsuit will run afoul of the D&O policy’s “Insured versus Insured” (“IvI”) exclusion. The IvI exclusion bars coverage for a claim by an Insured, against an Insured; this includes claims by former officers, as the capacity definition of “Insureds” includes “past, present and future.” However, there are widely-available modifications to the IvI exclusion. The best option converts the exclusion to “Company versus Insured,” barring only claims brought by or in name of right of the Company. Other options could reduce the amount of time during which the IvI exclusion is in effect to only one or two years after the founder relinquishes the director or officer position. Insure against risks that the PC’s insurance won’t cover. Finally, don’t forget that D&O insurance can only cover the PC’s board members – not the firm itself. And in litigation against venture- or private equity-backed companies, plaintiffs are no longer limiting themselves to naming the individual board members as defendants. Recognizing the firms as potential deep pockets, plaintiffs are getting more sophisticated, developing legal theories to name the relevant fund or even the firm itself as defendants. And while the PC’s D&O insurer will cover the defense of any firm general partner sitting on the PC’s board, the insurer will refuse to pay for the cost of defending the firm; if the two are being jointly defended, the D&O insurer will insist on an “allocation” as between them. Fortunately, the insurance market has responded to this risk by creating venture capital liability and private equity liability insurance. These insurance products provide a good back-stop against litigation risks. If your firm has not yet purchased such insurance, it is well worth considering. As the above discussion demonstrates, D&O insurance can provide invaluable asset protection to a general partner sitting on a PC’s board – and therefore, by extension, to the firm itself – if the insurance is done right. While likely not the focus at the time of entry into a new investment, once a general partner is on the board attention should be given to the PC’s D&O insurance. The firm may want to enlist the help of its own insurance counsel to review relevant indemnity agreements and insurance policies to ensure adequate protection. When the PC is hit with litigation, that ounce of prevention could be worth a pound of cure. Erica Villanueva is an insurance recovery partner in the San Francisco office of Farella Braun + Martel LLP. 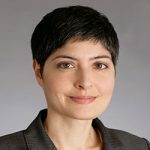 Ms. Villanueva advises policyholders seeking to maximize recovery under their insurance policies, including directors’ and officers’ liability, private equity/venture investing liability, employment practices liability, and general liability policies. Ms. Villanueva has substantial experience litigating insurance coverage disputes. Just as frequently, she collaborates with defense counsel to resolve underlying litigation with the maximum possible contribution from her clients’ insurers. Ms. Villanueva also advises on insurance policy placement, reviewing policy language and negotiating enhancements to policy wording.